You may have heard that preware.org was snatched away from webOS Internals yesterday. If not, what the heck? You live under a rock? I digress. Long story short, preware.net is now the new home for all things Preware to include our beloved patches, homebrew apps, etc. Don’t bother copying and pasting that as a link because until the ducks are lined up there won’t be much to see. I’ve been assured that the Preware Homebrew Documentation app and get.preware.net will all be updated in the near future. Come on. This stuff takes some time. Relax. But now that preware.net exists and more importantly, ipkg.preware.net, the home of patches, apps, etc., how do you fix your broken webOS Quick Install (WOSQI) and Preware that point to preware.org? UPDATE: Jason Robitaille has released WOSQI 4.6.0 which fixes a lot and makes it work with LuneOS now too! You can get it here. Post in the forum to say thanks or to ask questions. And consider donating! Preware’s version was bumped yesterday to 1.9.13. It fixes the .org problem and also the birthday icon which never got updated after last year’s Preware birthday. Anyway, to get Preware going again you have a few options. Option #1 – If you jumped down here because fixing WOSQI seemed annoying…well, you can skip to here but IF you fix WOSQI first all you have to do to get the updated Preware that fixes all the old .org feeds to the new .net ones is click the globe, search for Preware, and install it. 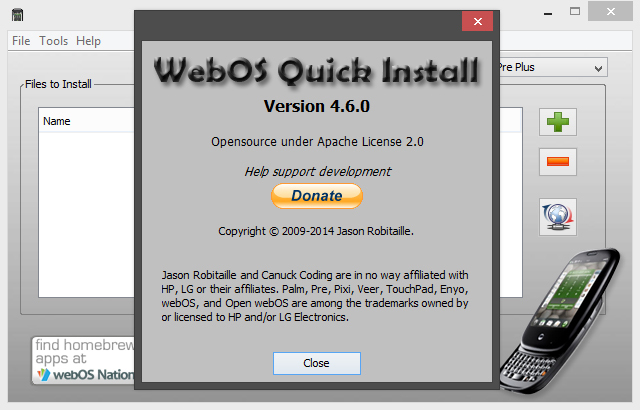 Option #2 – Uninstall Preware on your webOS device first. On your PC grab the .ipk here, plug your phone or TouchPad into your PC, open your broken WOSQI, drag the .ipk into the WOSQI window and click Install. Done. Now scroll up and fix download the new WOSQI. Option #3 – On your webOS device copy this URL http://ipkg.preware.net/feeds/webos-internals/armv7/org.webosinternals.preware_1.9.13_arm.ipk, open Preware, immediately swipe down for the menu and tap Install Package, paste the copied URL into the File box and click Install. Preware will close. Reopen it and you’re good to go. Note: When I first fixed Preware I had old beta feeds added and some of them didn’t auto-update to the .net address. To remedy the situation I uninstalled the new Preware, removed the beta feeds, readded the beta feeds, and reinstalled Preware. Problem solved. Well there you have it. Good luck! Thanks for the rundown. Good to know that webOSInternals and PivotCE are around to help. Half the time I write these articles to give myself a reference for future problem solving! Fixing Preware can also be done by adding “140.211.169.161 ipkg.preware.org” without quotation marks to the /etc/hosts file on the device using either novaterm or wTerm. Then launch Preware and it will notify you an update is available! Unofficial WOSQI (WebOSQuickInstall-4.5.1.jar) downloaded from link above, “download the .jar here”, which points to dropbox file, did the trick…got PreWare on my shiny “new” Pre3. Thanks to the pivotCE and Webos Internals teams for continuing to support webOS. The host file trick for WOSQI seems the simplest soln. Hope Jason can get around to releasing a official update. Many thanks for your solution, Jason. Works like a charm! Thank you very much for help! Happy to see webOS still alive!!! Fix Preware: Option #3 worked fine. who gave me some excellent hints. Wow! Lifesaver. Consider yourself kissed. Thank you guys so much. I havent gotten out my touchpad in years. But i’m glad I did, and this helped me get back into the loop.